The Postgraduate Conference enables discussions that interrogate the concept of intersectionality and constructions of gender as these intersect with other components of identity derived from political, social, cultural, religious, ethnic, and racialized discourses. Intersectionality (Crenshaw, 1991) is a framework and a methodological lens for understanding the kaleidoscopic subjectivity of women. Within Gender and Women studies, a woman’s subject status is claimed, held, and negotiated at the intersection of competing sources of disadvantage and discrimination. Class, race, caste, age, religion, and ability act within overlapping realms to shape women’s lives in the modern world. We are seeking to explore the tensions that emerge between theory and lived experie nce; between professional practice and theoretical models of gender and community interaction; and between public pronouncements of gender equality and representations of identity in historiography, literature, film, and popular culture. 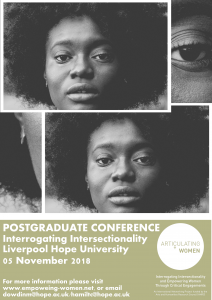 This conference is part of an AHRC funded International Network Project that seeks to scope the potential and limitations of intersectionality in relation to both theory and praxis. In keeping with this broad-based agenda, the organisers seek contributions from any discipline and welcome interdisciplinary approaches. Proposals for 20-minute papers, or for panels and workshops, including workshops on gender studies as methodology, should be uploaded, along with a short cv, to the Project website (www.empowering-women.net) by 15 October 2018. There will be a registration fee of £25. Lunch will be provided. Those whose papers/ panels have been accepted will be expected to register through the Liverpool Hope University On-line Store by 30 October 2018. Those who have not done so will be removed from the programme. You can download this Call for Papers here: Interrogation Intersectionality Postgraduate Conference Call for Papers. Informal enquiries may be made to Michael Dowding, Project Administrator, at dowdinm@hope.ac.uk or to Professor Cynthia S. Hamilton, conference organiser, at hamiltc@hope.ac.uk. Submit a proposal for a conference paper here. If you would like to submit a proposal to present a paper virtually, please contact the Conference Organiser: hamiltc@hope.ac.uk.